Visual Studio Code>Programming Languages>ModelicaNew to Visual Studio Code? Get it now. 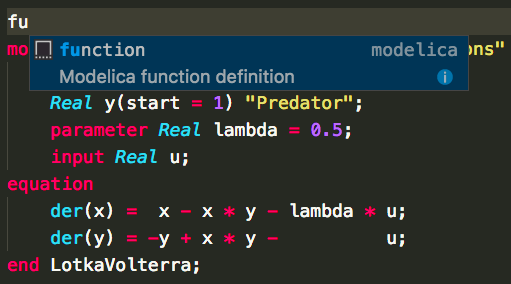 This extension adds support for the Modelica language to Visual Studio Code. Both grammar and snippets are imported from this implementation in SublimeText. Type ext install Modelica in the command palette. Select Modelica in the list of languages. Alternatively, saving the file with a .mo or .mos extension will allow VS Code to understand that it is a Modelica file and automatically select the language correctly. 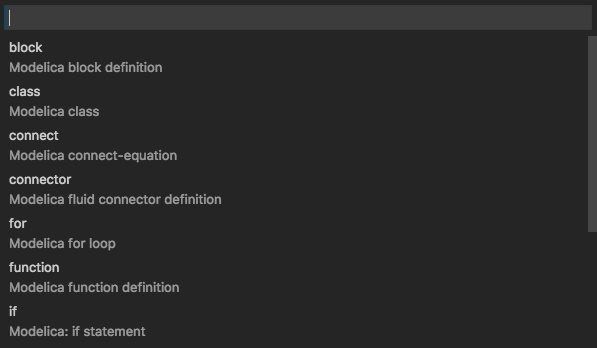 Additional extensions can be connected to the language in any settings.json file using the "files.associations" setting. Just start to type and choose a snippet that may be proposed. Alternatively, use Ctrl+Shift+P to open the command palette and type Insert Snippet to see a list of all possible snippets to choose from.